Something unusual is going on in the crypto world: irrational exuberance around ICO investing. For the uninitiated, an ICO is an “initial coin offering.” The name ICO is actually a misnomer — it sounds like an IPO, but it’s quite different. While IPOs require a product and some standard level of investor diligence and customer traction, ICOs don’t require any of that. An ICO is an easy way for anyone with an idea to raise funds in exchange for ownership from anyone in the world. The core difference between an IPO and an ICO is exciting for the same reason that we love Bitcoin (financial inclusion). But that same difference has also resulted in some concerning activity lately. This week, there have been two prominent ICOs (Firstblood.io and ICONOMI). These projects have raised more than $12M in total with nothing more than websites and white papers heavy on marketing speak. Calling these docs “white papers” is also a misnomer — white papers tend to be academic in tone and demonstrate technical research. The docs these teams put together lack both these attributes. As a venture investor, I primarily do Series A investing. From where I sit, the bar to raising a $5M+ Series A is generally $1M in annual recurring revenue or 1M monthly active users. There are many exceptions to this (exceptional entrepreneurs, big tech breakthroughs, etc), but every week I meet talented founders leading companies that have products and customers who aren’t able to raise a $5M Series A due to lack of traction. The professional investor market has effectively set this bar for raising money in the private markets. In crypto land, this week we’ve seen two projects raise $5M+ in a matter of days by selling a vision rather than demonstrating traction, ability to execute, or evidence of technical research. The crypto market has set the bar shockingly low for entrepreneurs to raise money and this is dangerous for everyone involved. Why is there such a significant divergence between venture and crypto funding? Crypto enthusiasts have experienced significant gains from BTC and ETH recently and are now overweighting vision and underweighting execution when making investment decisions. 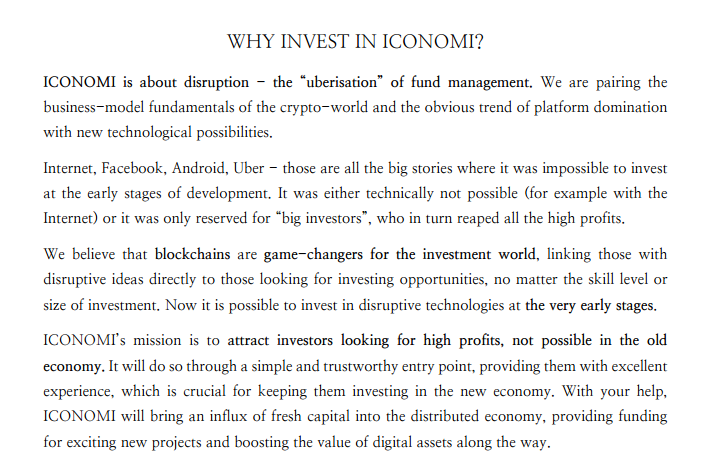 It’s easy to get excited about an eSports competition platform (Firstblood) and a platform for managing crypto funds (ICONOMI), especially if you’ve benefited from the rapid appreciation in BTC and ETH over the past few years. Crypto enthusiasts (myself included) want to see these types of projects come to fruition; the visions are alluring. The projects haven’t delivered anything tangible yet though. These fundraises are getting done based on vision rather than any semblance of execution. This has been a problem on Kickstarter for years and I’m fearful we’re going to see a lot of the same in the ICO world. The common arguments against appcoins are either legal (regulators may shut these down) or idealogical (BTC rules all) and while these could be right, these aren’t the main reasons I’m concerned with appcoins. I’m concerned with appcoins because of the irrational behavior taking place in the crypto investor market. While it sounds attractive to a founding team to raise $5M+ right off the bat with little effort, what comes with that is expectations that are incredibly hard to manage. And navigating a successful startup project is all about managing expectations. Unfortunately, it’s my sense there will be some more pain before there’s progress in the space and the activity around Firstblood and ICONOMI cemented that for me this week. I’m excited about crypto token protocols long-term and think there’s several promising projects in the works currently and many more to come. But there needs to be some standards around launching an ICO and investing in ICOs in the space and I caution all to tread carefully until those standards emerge. If you enjoyed this, follow me on Twitter and subscribe to Control, a newsletter on the protocols, projects and entrepreneurs that are putting control of power in the hands of the people.